Why do you have articles about meditation and food on a beauty blog? Real beauty isn’t the images we often see plastered to billboards, across magazine pages and on television advertisements. While much of the Western world has become hypnotized by these depictions, they are nothing more than an unrealistic benchmark of beauty, created through clever photography and digital manipulation. EcoBeautyEditor.com is about embracing authentic beauty by living in tune with nature. Every choice we make, from the words we speak and the thoughts we think to what we eat and what we choose to put on our bodies creates true beauty, from the inside out. How do I sort through the hype to know what’s really an eco beauty product? • Can I eat it? That is, is it literally a food? • Is every single ingredient listed sourced from nature? • Are most of the ingredients organic? • Is it certified organic by a regulating body? • Have any of the ingredients been processed in some way, changing their natural composition? • Does it contain fragrance, parfum or phenoxyethonal? • Can I pronounce or understand what the ingredients actually are or are derived from? • Is it tested on animals? • Listen to your intuition: does the product feel authentic? If you have time to research, look into the company that produced the product. What do they stand for? What is their overall philosophy? For a list of toxic ingredients to avoid, click here. It’s also important to remember that just because a product uses the word “natural” and “organic” on its label, doesn’t ensure it’s 100% natural or organic — or good for you. Are all of the products and services listed on EcoBeautyEditor.com conscious and healthy? Before writing about, reviewing or recommending any product on EcoBeautyEditor.com, I thoroughly research not only the product or service, but also the company behind each. 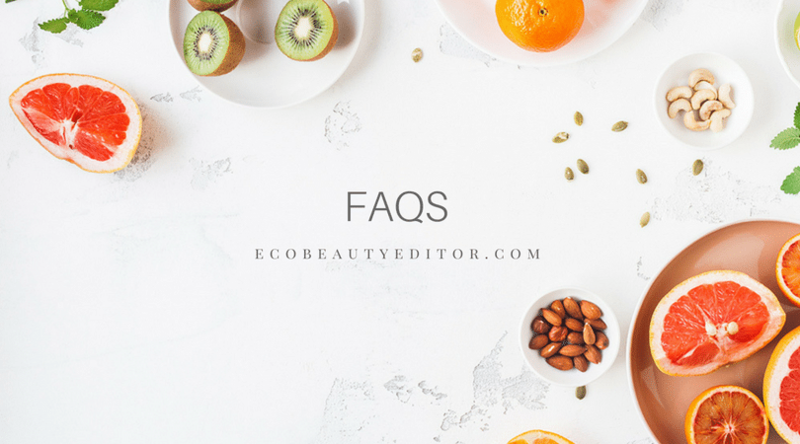 Every ingredient is scrutinized and many questions are asked to determine if the product or service fits under the eco beauty guidelines, many of which are listed above. If you have concerns about any product or service listed on this website, please don’t hesitate to contact me here. It may happen that some interview subjects mention products that are not natural. These products will not contain a live link. Also, it’s very important to note that some companies do produce some products that are natural, but others that aren’t. I will feature only natural products from such companies. It’s important not to assume that all products from all brands are natural. Please be sure to do your research carefully if you are seeking purely natural products. Do you write about every product sample you receive? The only time I write about any product is when it is 100 percent authentically eco, regardless of whether it has been sent in for review. Are all advertisers 100% eco? Advertisers are screened to ensure their products and mission fits that of EcoBeautyEditor.com. It may happen that a particular advertised product is eco, but this does not guarantee all products sold by a particular company are 100% natural (as mentioned above). I encourage the EcoBeautyEditor community to do their own research when leaving this site. I regularly monitor external links that are placed by outsourced companies to ensure the links fit EcoBeautyEditor.com’s philosophy. If you believe there is a link that is in breach of this, please don’t hesitate to contact me. What advertising methods does the site feature? I sometimes link to affiliated products and services, however, these are strictly those that I 100% believe in and would buy myself. This means I get paid a commission if you purchase a product or service that is linked to in the content. Reviews are driven entirely by myself and the editorial contributors based on what we think, and are in no way influenced by advertisers. I’d love to run a copy of one of your stories on my own website. Is that okay? All content on EcoBeautyEditor.com is copyright and can only be reproduced with written permission from EcoBeautyEditor.com. Please send an email if you would like to make a request. Hello, I really enjoy your site. I have an all natural/organic facial cleanser that I would love for you to try. Do you accept samples? Hi Keila, I do trial sample products all the time, but not all are reviewed. Feel free to email me at info at ecobeautyeditor.com if you’d like further info.